This comes to wish you all a Happy Christmas. I’ll be taking a break from the blog for a few days – possibly until the beginning of January next year. P.S. Father Christmas wanted a keepsake ‘selfie’; so I obliged. I hope that you and your family have a great Christmas Bill. Put your feet up and have a rest. Only joking. Your blog is always great reading and is permanently open on my computer. Great stuff. Merry Christmas to you and yours Bill. I love following your progress on Minnow. Look forward to tagging right along when you pickup the work again. Enjoy the holidays and your family. :-) It is interactions like this that make the internet such a worthwhile endeavor. Without neither of us would know of the the other or our similar interests. 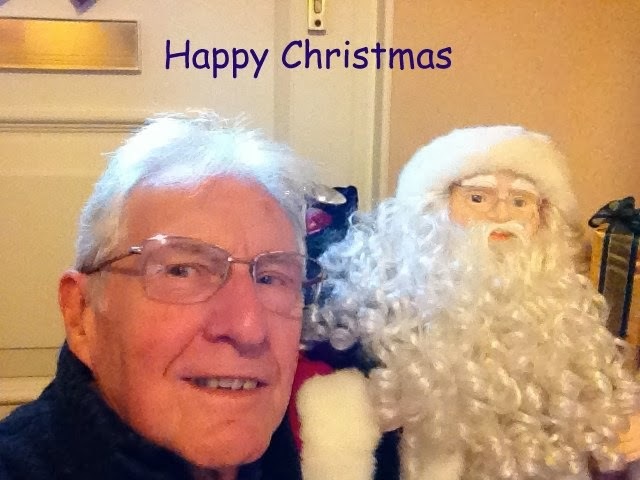 Hi Bill - Merry Christmas to you and your family. And many thanks for your blog...a breath of fresh air. Thanks everybody for your kind greetings. My Christmas was pretty hectic, but things are settling down, and hopefully I'll find opportunities for finishing 'Minnow' before the end of March. The weather will play a big part in my endeavour.